Public spaces (West Concourse study area, North Entrance Lobby, North Gallery and first floor Atrium) are scheduled on a first come, first serve basis for all CAHNRS related events and activities. Departments unaffiliated with CAHNRS may reserve the public spaces on a first come, first serve basis so long as there are no conflicts with an existing CAHNRS reservation. To submit a Schedule Request, you can use the link below. Please note you will need to have a WSU username (NID) and password in order to submit the request. If you need access to a Vogel Public Space outside of normal business hours, you will need to contact Tami Nordquist. She is the point of contact for requesting keycard access to the building as well as a physical key for Vogel 43 should you require chairs and tables for your event. It is the organizer’s responsibility to ensure chairs and tables that are moved out of Vogel 43 are put back after the event. The Atrium in Vogel Hall is located at the north end of the building on the first floor. 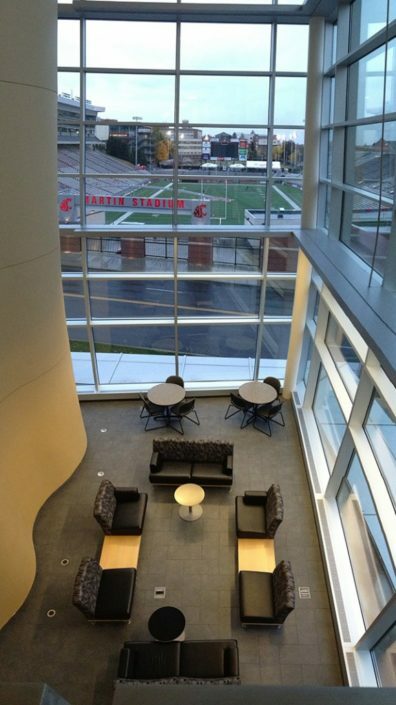 It is an area where students are able to study and relax, while overlooking Martin Stadium. The Concourse is located on the ground floor of Vogel Hall. It allows access to the four labs on the ground floor, and has eight study areas for student use. 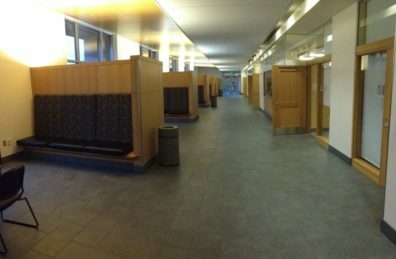 The Gallery and North Lobby are located at the north end of Vogel Hall. They are used for student presentations, and lead to the concourse and to the upper levels.